I’m failing miserably at convincing myself that the iPhone 5 is a good enough camera. I mean, it probably is a “good enough” camera, but I’m not interested in good enough images any longer. More specifically, I’m not interested in photos that only look good on my iPhone’s screen. I want to make something worthwhile on every screen. I was particularly drawn to Shawn Blanc’s mirrorless camera research from late 2012. In his piece, Shawn outlined exactly what he was looking for, why he was looking and how he was looking for it. I think it was a very humane way of revealing a consumer’s decision-making process. In the world of photography, that decision-making process is more complex than most. As a result, I feel obliged to outline my own wants and “needs” that sway my future camera purchase. I think it’s important to note that I have dabbled in DSLR photography in the past. I purchased a Nikon D5100 with an 18–55mm Nikkor kit lens about two years ago and I added an 18–200mm Nikkor VR lens for travel purposes. It never truly took ahold of me though — I snapped some great photos, but it was never a realistic tool to truly use. I justified the purchase to my now-wife by stating that I would use it for travel in the future. I went on two trips while I owned the D5100 — one to Vancouver and the other to Calgary — and I snapped 15 photos during each trip. My travels had more purpose than just touring, so whipping out my DSLR was never a priority. However, each trip allocated one evening for touring and, even during these dedicated photo snapping moments, I bailed on my D5100. I just couldn’t stand the size of my rig. I also couldn’t stand the rudimentary controls of the D5100. At the time of purchase, I heavily weighed the D5100 against the Nikon D7000. Both had the same cropped sensor and the same processor, but one was weather-sealed, bigger and offered more power-user features. I decided that the cheaper and more basic option would be best for my beginner’s needs. It didn’t take me long to understand the value in manually adjusting ISO and shutter speed on-the-fly. I knew I could program one button to adjust ISO, but I felt I spent far too much time in the menus and far too little time shooting. So I sold the D5100 in November 2013. Until recently, I was content with my iPhone. More specifically, I was content until I stumbled upon the world of mirrorless cameras. Before I jump into the ocean, I need to decide where I’m going to jump. Luckily, outlining the necessary features of a camera system will also help justify the purchase to my wife. First, this camera is for the two of us. I have some minor experience in photography and I understand how technical specifications play a role in a final photo. On the other hand, my wife has no experience with photography and wants a camera that she can grab, turn on and snap a great photo with within seconds. Overall, this means I need a simple camera that has some power features to maintain my interest and improvement in the long run. Through my research, I’ve already determined that I’m not interested in the Micro Four-Thirds sensor size and, although tempting, I think full-frame is out of our skill range. I don’t think there are many full-frame mirrorless offerings to date, so this should help the decision-making process. Technical specifications aren’t of the utmost importance either. I’m hoping for a sensor between 16 and 24 megapixels and for a camera that is pretty good in low light. I would also like a well-performing electronic viewfinder, but it isn’t required. Proper image stabilization would also be nice, but I don’t see myself needing IS to the extent others might. The most needed (wanted?) tech spec will be wireless sharing. I want to quickly send my photos through a VSCO Cam preset on my phone before sharing them on Instagram, Flickr or a theoretical portfolio. This is perhaps the only specification I care about. However, when we make our decision, I don’t think any chart will be the persuasive factor. Second, this camera needs to be small and light. My D5100’s travel justification fizzled after my first real trip with it and I can’t let that happen a second time. I would prefer that this small and light camera would also be weather-sealed for our infrequent travels. A small and light lens would be needed for those infrequent travels as well, but that’s another article for another day. Third, this camera needs to be relatively affordable. Conor McClure asked me on Twitter the other day about our camera budget and I had a hard time answering the question. This is mostly because I want to buy something that my wife and I both love. I don’t want to buy a camera system that we both look at within a week and realize we cheaped out. If that means we need to buy a Leica for the two of us to be happy, we’ll end up spending the money. The more I research, the less I think this will be the case. However, my biggest goal is to not have my budget play a role in the camera selection. Fourth, and I think most importantly, I need a camera that sparks interest in both of us to actually snap photos. If and when that camera is picked it up, it needs to be used. It needs to instill delight in the two of us. I have to look at it and yearn to take a photo. This is a really touchy characteristic that is dependent on our changing tastes and (largely) on how big our pocketbooks are. I have a few frontrunners at this point in time. These cameras have caught my eye and I’ve read some reviews that seem to unanimously state how good they are. However, my research and experience is limited. If you know of a system that would fit my wife and I, do not hesitate to give us some advice. This is the camera Ben Brooks swears by and I fully understand why. X-E2 reviews are brimming with praise. Fujifilm is increasingly making a name for itself as one of the world’s leaders in mirrorless camera technology. Their camera bodies are light and durable. They’ve found great spots for buttons and dials on their camera bodies and these spots satisfy power users and beginners alike. And their camera bodies are designed with a certain nostalgia. They also utilize Fuji’s increasingly renowned Fujinon lenses. According to Brooks, these lenses capture skin-tones like the best of them. Ken Rockwell concurs and states that the new Fuji XF 56mm f/1.2 is the best 85mm-equivalent lens on the market. And Ken knows his stuff. 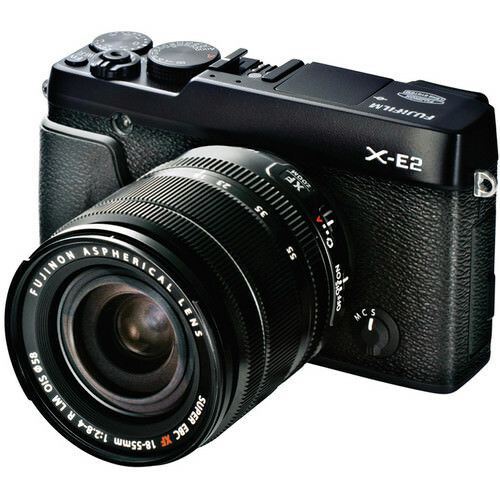 The X-E2 fulfills many of our needs outlined above. It is relatively small and light. It has a simple approach that is quickly adjustable with dedicated buttons and dials. The X-E2 is affordable (in comparison to some of the other options I’m looking at) and apparently utilizes an awesome — and growing — set of Fuji X-mount lenses. As of right now, I would say the X-E2 is the frontrunner. But let’s delve a bit further. I understand this is a micro four-thirds body, but it’s the only micro four-thirds I’m considering. It has slowly wiggled its way out of contention because of the micro four-thirds limitations but there are too many great things about the E-P5 to entirely rule it out. 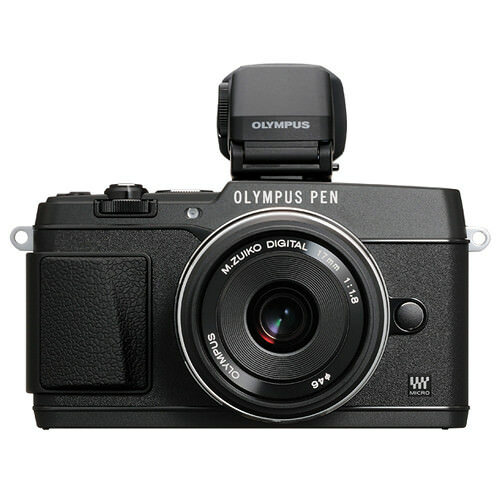 Olympus’ PEN line of mirrorless cameras is widely loved and widely used. The PEN has been consistently updated on an annual basis for the last five years and it has constantly improved its shooting experience. The E-P5 tops Olympus’ PEN line and is more or less responsible for creating the mirrorless camera craze a few years ago. Shawn Blanc settled on the Olympus PEN E-PL5 — the middle offering in the PEN line — because it offered the same image quality as the E-P5 with fewer power features and for less money. However, when comparing our two contexts, I think I have slightly more photography experience going into my purchase and I know the E-PL5 wouldn’t be my ideal shooter. The E-P5 is small, light and extremely portable. It takes advantage of the widely adopted micro four-thirds format and has a lens selection greater than any other option on this list. It is super affordable and sits in an almost ideal spot for our needs. It also takes awesome photos which, at the end of the day, is all that’s important. However, I’m still wincing at that micro four-thirds thing. I won’t rule the E-P5 out just yet, but it’s a longshot at this point. Sony is pulling off some impressive innovation in the mirrorless market. Sony’s NEX lineup has always been known for its great image quality and great shooting experience. With the A7 and A7R, Sony pushed mirrorless cameras into full-frame DSLR territory. As a result, Sony has caught some of the big camera makers on their heels and I can’t wait to see where Sony’s presence pushes the market. 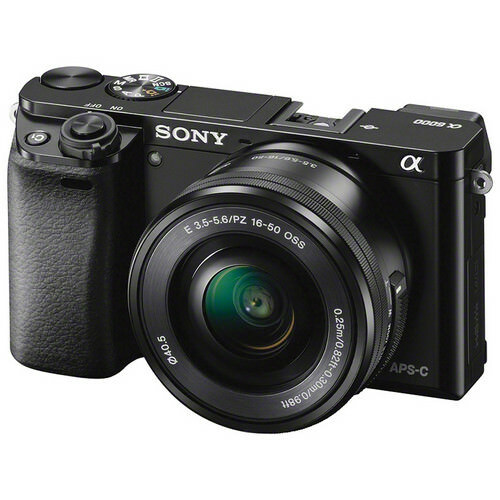 The A6000 replaces the extremely popular NEX–6 from 2012 and touts a 24 megapixel sensor. It takes advantage of Sony’s large lens lineup and, due to Sony’s manufacturing of Nikon’s past sensors, I’m sure I would feel right at home with Sony’s sensors. However, Sony’s lens lineup is what keeps me pulling away from the A6000. I’ve read a few reviews that state Sony’s glass is holding back the Alpha line of mirrorless cameras. When buying into a system, the last thing I want to read about is poor glass. This is a big turn-off at this point and I’m hoping I just read the wrong reviews. Fujifilm’s newest mirrorless offering also appears to be their best. The X-T1 looks the part, delivers the part and promises the part. Its nostalgic look hearkens back to good ol’ SLR days and promises to spark excitement upon first glance. 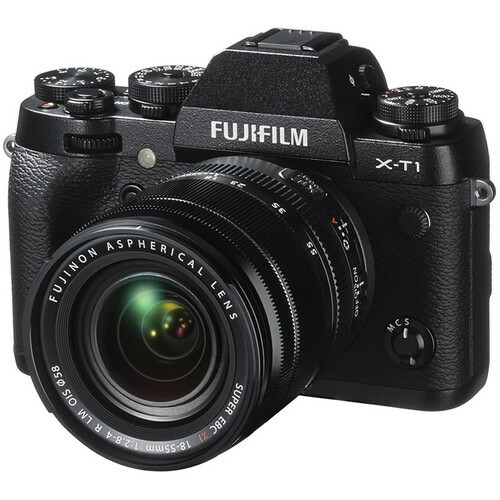 The X-T1 body is also extremely durable and well-built. It’s made of a sturdy block of metal and all its buttons and dials are made of metal. Adding to that is the multitude of dials — there are five dials on the X-T1 which promise absolute control at all shooting levels. Ken Rockwell very recently reviewed the X-T1 and stated that it was his first choice as a mirrorless camera. He compares the X-T1 to the Leica M240 and admits the X-T1 blows the Leica out of the water. Wow! The biggest drawbacks to the X-T1 for my wife and I are its size and its fairly overwhelming control scheme. The X-T1 stands as tall as my old D5100 and, being made entirely of metal, can’t be all that light. Ben Brooks stated in his X-E2 review that the X-E2 can’t be comfortably carried in a pocket; according to Camerasize.com, the X-T1 is bigger than the X-E2. I’m also sure those five dials would completely turn my wife away from it. I also slightly cringe over the X-T1’s price. Although an affordable camera, the X-T1 is at the higher end of our pricing range and I’m unsure of the implications of the $1300 body-only price tag at this point. It’s funny that I would include the completely new Leica T in my consideration list right after stating the Fujifilm X-T1 may be too expensive for our liking. Everyone knows Leica is an expensive system to buy into. I’ve also heard that once you go Leica, it’s increasingly hard to go with anything else. The reason I include the Leica T on my list of frontrunners is because it fits our needs perfectly. 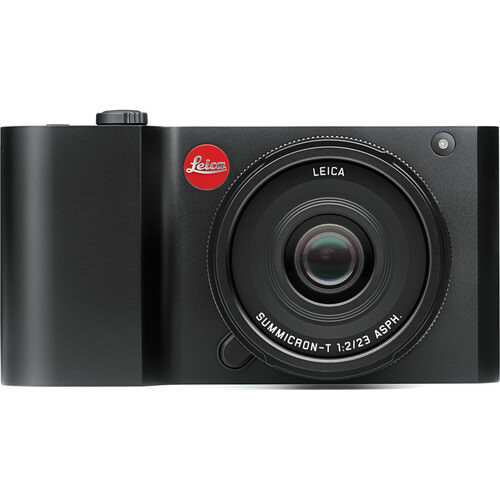 The Leica T is small, light and durable. It has sufficient specifications and ushers the most up-to-date technology into the Leica brand. Its control scheme is simple enough for my wife to enjoy and its dials are just enough for me to giddily toy around with. And it looks amazing — could a camera possibly be designed any better? I believe the T’s design alone would be enough to spark that delight I mentioned earlier. The Leica T is also the cheapest way of entering the world of Leica’s renowned brand. With the help of an adapter, the T can use all of Leica’s M lenses and Leica has promised new T lenses in the future. The T is only Leica’s fifth lens system in the past 90 years, meaning the system will probably be developed well into the future. Seriously though, the Leica T isn’t cheap. A T body sells for $1850 and its first two lenses — a 23mm prime and an 18–56mm zoom — sell for $1950 and $1750 respectively. Add any accessories, like the $600 electronic viewfinder (with GPS!!) or the $400 M Adapter-T, and you’re looking at $4000 or more just to get started. At that cost, I would probably expect better performance and more features. Alas, that’s opinionated design for you. Update: After watching this video, I’m more or less convinced the Leica T isn’t what we’re looking for. I still can’t get over the T’s beauty though. Unlike Shawn’s well-written article from November 2012, I haven’t come to a decision at this point. Every camera discussed above has incredible features that would potentially fit my wife and I well. Overall, I think I’m leaning toward the Fuji X-E2 and away from the Sony A6000 and Olympus PEN E-P5. The frustrating part in my opinion is the limitations of having to buy into a system as opposed to a camera. Each company (excluding the adoption of micro four-thirds) has made their own proprietary mounts that limit your ability to jump around with different branded lenses. Sure, many of these companies sell adapters to decrease the limitations, but the system must be taken into consideration at the time of purchase. Another disappointing factor is having to have a budget. This is evident in all aspects of life and I’m not looking for someone to give me a lecture about buying something we can’t afford. However, if there is one thing the purchase of Apple notebooks, phones and tablets have proved, it’s that an experience that instills delight is really hard to put a price tag on. I know a Retina MacBook Pro is a fairly expensive computer. I also know that I’ll enjoy all the benefits it brings to my life and my work. We have no previous experience with Leica, but this is the biggest factor in our holding out for the luxury brand. Luckily, we have some time. We have no pressing need for a camera over the summer and we can let the market play itself out before making a final decision. My wife and I are hoping to head to Europe as a graduation trip next spring or summer, so we’re hoping to have a great camera and lens before we leave. For the time being, I’m going to continue reading reviews, absorbing opinions and salivating over product photos. And I’ll probably annoy my wife with my excitement as well. This is me saying sorry ahead of time.